Contractor Testimonials - Read Reviews from our Existing Clients! Joined just a few months ago but everything has been pretty smooth so far. Great personal service. Very simple low time investment portal. Thanks Freestyle! Great service with simple tools that do the job nicely. Great support also! Your accounting services are a ‘breath of fresh air’. I certainly would recommend you to many more. You have a fantastic team, keep up the good work. Jade Merrett especially has been fantastic in helping us, the others have also been good. The help and advice I have received has been second to none. Very friendly and helpful setting up ltd company. Always willing to answer the many questions I had. 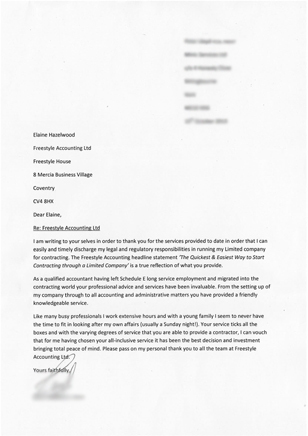 The service I have received from Freestyle Accounting has been first class from the start. No question was too small for them and the team have proved most cheerful, willing and professional at all times in their dealings with me. The online portal for day to day accounting is intuitive, well designed and does exactly what it says. I would have no hesitation in recommending Freestyle to anybody. A late starter to the world of self employment, Freestyle have helped with the set of everything from insurance to bank accounts. Going forward I am confident they will keep my business on the straight and narrow and hopefully help me avoid the pitfalls of self assessment, tax and vat,. It has been a pleasure dealing with Freestyle Accounting and the team of people there. Very friendly, helpful and knowledgeable staff who are quick to respond to any queries. They made my first foray into the world of contracting a very smooth and hassle free experience. I would not hesitate to recommend them or to return to Freestyle Accounting should I decide to go contracting again. Very knowledgeable about the latest accounting rules and theories. Respond quickly to any questions or queries i have. Excellent online portal making my life easier. Personal approach. They are prompt at responding to questions and are always happy to go over things in more detail should I ask. Excellent customer service and the team are always on hand to answer all questions. The team always respond to emails and phone calls and have answered. Keep up the excellent work. Freestyle helped me through setting up a limited company as part of my first contracting job. They pretty much walked me through everything and were friendly and helpful throughout the process. They do charge a premium but the level of service is great and for something as important as this it is worth the price. Very helpful staff, easy to contact and always quick to reply with advice. Stress-free interactions and staff keen to go above and beyond to help clients! I found Freestyle Accounting on-line when looking to setup my company. They offered great initial advice followed by setting up the company. The online portal is a great asset, which means I can manage my business effectively and keep up to date with invoicing and the latest accounts. I have found Freestyle to be very helpful and always willing to help. As this is the first time I’ve set up my own company Freestyle explained everything that I needed to know and do. You have made the move into running my own company painless and no questions have been too hard for you to answer. Your advice and guidance has been first class and I find your portal really easy to use. Having recently entered into the contracting market, the team at freestyle have made it so easy for me to get setup and running with little or no fuss, I’ve been able to get paid raise invoices and keep track of all finances easily and quickly with the portal. The team have also been very quick to respond to questions I have (being new to contracting I’ve had a few). I would wholeheartedly recommend them to anyone. Very impressed with Freestyle and the team. My company set up was seamless and was turned around in a couple of days. Highly recommend. Kathryn helped me setup a limited company so I could operate as tax efficiently as possible. The service has been great from Karhryn and the team and I’m really happy with the all-inclusive service, it makes my life a lot easier. Kathryn and her team have unceasingly provided great service and advice on the best & most tax efficient methods of working. They have not only saved me money from a company perspective, but also from a personal one too. Their advice has been sound and well thought out. Other than a couple of enhancements to the portal they provide, there is little else they could do to improve an already great service. We started a new business and needed accountancy services. We also needed someone to complete our tax returns for us. Kathryn efficiently set us up and got us running with a new system within a new business. She also took on our personal tax. My situation was quite complex with foreign income, joint property rentals and limited company income. Kathryn is also very proactive at requesting documents for completion of the tax return to save us all from last minute panic! Kathryn provided invaluable clear, concise and comprehensible advice regarding my company’s tax liabilities and my own self assessment obligations. She produced my company’s end-of-year accounts and my own self assessment return leaving me to concentrate fully on running my business. Kathryn was able to answer all queries and difficulties I had, always effectively and swiftly. She became a first port of call for any accountancy issues, as well as more-standard tasks that were needed. The limited company has ceased to exist, but Kathryn was still able to assist with tax returns and the insolvency process of the firm. She has been as helpful now as she was when the company was trading. After a good number of years operating through the same accountant, I was looking for a change to the services provided; I wanted something more modern, who could appreciate my personal circumstances and provide an overall better quality of service. In 2012 I made the change to Freestyle Accounting after some 18 years of working with my previous accountant. Since then I have worked closely with Kathryn and found her to be open, honest and extremely reliable; a significant change for me having received a service to the contrary in previous years. Kathryn is always helpful and understanding and is skilled in simplifying accountancy matters so that they can be easily comprehended by the client. Kathryn helped with a difficult migration from my previous accountant and has worked with me to adopt ways of working to meet my particular circumstances; this is constantly reviewed and changes applied where necessary. I continue to operate through Freestyle Accounting and feel safe and secure in my working relationship with Kathryn. I would definitely recommend Kathryn to anyone looking for an accountant who can be trusted and one always works with the clients best interests at the front of all affairs. Kathryn has been very helpful whenever I have had a query. Recently Kathryn arranged for my personal portal to be updated the same day as I forgotten to do it. This meant that I could draw from my company’s funds and pay myself. Freestyle Accounting was recommended to me by a friend. Initially my conversations were around getting set up and even though I was not using or paying for any services the Sales Manager (Jon) was extremely helpful in answering any questions I had over many phone calls. Eventually, 7 months later when I began using their services, I can not think of a word to say how brilliant they have all been. The portal is very easy to use and most things are self explanatory. Someone is always there to help out with any questions, whether that is via email or phone. The staff are all friendly and experts at what they do and that is clear throughout every means of communication. Would definitely recommend to anyone. I’ve been with them 10 months and have had excellent service. Phone and email enquiries are handled quickly. Beyond issuing your invoices through their portal and paying your bills when told to, they handle virtually everything – tax forms…the lot. I have no hesitation in recommending Freestyle. They do what they say they will do, and do it well. Freestyle Accounting were recommended by a friend, and having previously experienced poor service from a competitor, I have been very impressed with Jon Robinson and his team. Their portal is easy to use, and returns all the relevant figures you need to know. Any questions or queries that I have had, have been dealt with promptly by team members in a friendly manner. Five star service. For starting up a business with limited knowledge of the steps you need to take, Freestyle Accounting are a great help. They always have knowledgeable staff available to talk over the phone or respond to emails on the same day and so far I have nothing negative to report. Once up and running, they have an excellent online portal system to help organise the financial side of your business as efficiently as possible. This tool is excellent. Although Freestyle Accounting may cost more than the average accounting firm, I feel at the moment I am getting a quality service which is value for money. I found freestyle by chance when searching for an accountant. I have to say I am glad I did. The portal software is excellent and makes it very easy to keep track of your business cash flow. I have always found the entire team at Freestyle very helpful if I had a query or needed some assistance with the portal. I highly recommend Freestyle for contractors. I was recommended Freestyle by a friend when I decided to become a contractor. I have been using them for over a year and their service has been excellent. Their all in one package has saved me a lot of time and hassle with setting up my Ltd company, bank account, Indemnity insurance and submitting my expenses, VAT, corporation tax and personal tax returns. I have found their staff to be always responsive and helpful. If you want a belt and braces approach to your contracting administration around accountancy, financials, IR35 etc then freestyle is for you. However you do pay a premium for this service!! We started a new business and needed accountancy services. We also needed someone to complete our tax returns for us. Kathryn efficiently set us up and got us running with a new system within a new business. She also took on our personal tax. My situation was quite complex with foreign income, joint property rentals and limited company income.Kathryn is also very proactive at requesting documents for completion of the tax return to save us all from last minute panic!. Yes, 2014 tax completed. Kathryn was able to deal with all the complexity and produce the tax return in a short space of time. Any questions quickly answered and the process moved on. I was returning to contracting after several years away from it. My previous accountant had been dreadful and I was looking for one that knew what they were doing, could talk in English, and could help me understand the things I needed too. Kathryn and her team have unceasingly provided great service and advice on the best & most tax efficient methods of working. Kathryn and her team have not only saved me money from a company perspective, but also from a personal one too. Their advice has been sound and well thought out. I went from being an employee to working as a freelancer so I needed an accountant. Kathryn helped me setup a limited company so I could operate as tax efficiently as possible. The service has been great from Karhryn and the team and I’m really happy with the all-inclusive service, it makes my life a lot easier. As an independent contractor, I had decided that the use of an Umbrella Company was no longer the best option and needed to set up a Limited Company to administer my freelancing activity. Kathryn provided advice and guidance from setting up the business on “day one”, and throughout the company’s seven years of trading. My day to day bookkeeping was managed through an easy-to-use web portal which simply required me to enter invoices, payments and expense items etc. Kathryn looked after the Accounts preparation, submissions, VAT returns and Payroll. She also helped in the preparation of my own Self Assessment and with personal Tax Advice. This has continued until earlier this year when the Company ceased trading following my decision to accept a permanent position. Kathryn has continued to help with the winding up of the company. I am no longer trading and have taken up permanent employment instead. The company traded successfully for seven years and I am satisfied with what was achieved with the help and advice of Kathryn and her colleagues. Required an accountant who was reliable and would help me run my limited company correctly from incorporation to present time.Sincere thanks for all your help over the last week. John and Kathryn have delivered as they said and I am extremely pleased with the service I have received from Freestyle Accounting. I will of course be referring others to Freestyle as they offer 101% when it matters. I am extremely satisfied with the service I have received from Kathryn Houliston. She was instrumental when completing my company accounts at very short notice ahead of the filing date, so I could obtain a mortgage on my house. I would be at a loss if she was not there to help and answer all my queries in a timely fashion. Friendly, professional service and quick to respond to queries. I’ve been a customer of Freestyle since 2011, and cannot recommend them highly enough. Excellent service, excellent advice, always available and helpful regardless how stupid my questions are. Their financial portal is a very good way of tracking invoices, income, liabilities and dividends. Easy to use and very helpful. Always extremely helpful. Nothing is too much trouble. They know everything and it shows both in the service they provide and the quality of the information received. I was setting up my own company with a view to taking on consultancy work. I have always found the service from Kathryn and her team to be excellent. Any queries I have had have been dealt with very quickly. Nothing is too much trouble for the staff at Freestyle. My tax affairs have been dealt with in a clear and understandable manner. I would have no hesitation in recommending Kathryn and her team at Freestyle Accounting to other Contractors. My current situation is that I am no longer actively seeking or carrying out any work and am now in the process of closing the company. i have certainly achieved the goals that I set myself when doing this much due to the help given by Kathryn and her team. Starting my own limited company for contracting purposes. Very impressed. I can sleep soundly at night knowing that I will not incur any penalties from HMRC. That is all I ask for. Kathryn is always there when I need her for help and advise. Happily running my own contracting business, I leave the worry of my accountancy work to the professionals and get on with what I am good at. Just a note to you and the team, Freestyle have made the start in my new contracting career very easy and taken a load off my mind so thanks all round! I have always found Freestyle Accounting, in particular the tax department to be extremely helpful and knowledgeable. If I am promised a call back – it happens! If I had not stumbled across Freestyle on the Internet I would have a lot more worries, on a subject where my knowledge is woefully lacking. Thanks, Kalbir, Ceri, and Gurdip. Thank you very much for all your hard work and for the excellent service that I have received from Freestyle. I will certainly recommend Freestyle to anyone I meet who is contracting. I appreciate the lengths that Freestyle contractor accountants have gone to, to accomodate my circumstances and thank you very much for the service and flexibility that you are providing me…..please pass on my gratitude and satisfaction with the Freestyle service to your management and assure them that I am recommending Freestyle to all colleagues who are considering contracting at the moment. I have been very happy with all the advice and support I have received from everyone at Freestyle, since I joined in September. I would recommend this service to any IT professionals looking to start out on a new career in IT contracting. Freestyle have helped me set up my business and I feel very confident that I have everything in order. The best thing is that I do not have to worry about anything, because all my questions are answered quickly by professional staff. Everyone in the team is friendly, responsive, highly knowledgeable and consistently provides a personalised professional 1st class service. I am genuinely treated as an individual valued customer, not just another number in the system! I’d have no hesitation in recommending the service to fellow contractors. Keep up the great work! I chose Freestyle Contractor Accountants because they were one of the few accountancy practices that actually told me from the outset exactly what service I could expect and were upfront and honest about the pricing, there doesn’t seem to be any hidden costs on top of the monthly fee, everything is included. Freestyle removed all the stress of contracting in an instant, leaving me free to concentrate on my actual work instead dealing with other affairs that I don’t really understand. They pro-actively do it all. The online portal is excellent, even though it is browser based application it performs as well as any desktop client I’ve used. It’s simple, intuitive and well maintained. It is always up to date and I can easily see my current state of affairs with confidence that it is accurate. Freestyle has taken the admin and worry out of Ltd Company accounting. I imagined the process would deliver headaches not experienced in PAYE taxation but, thanks to the informative and timely nature of the Freestyle team and the instant usability of the portal, the transition has been seamless. I have been a member of Freestyle since April and have been thoroughly impressed with their professional and timely response to all my queries. I would recommend Freestyle to any professional who is looking to setup there own Limited Company, they walked me through the whole process of setting up my company. They offer an all-in-one service with no stone left unturned, which allows me to concentrate on my actual work. In my eyes this is priceless. Having switched accountants to Freestyle a few months ago, I can’t believe the difference in the level of service I’ve received. My accounts were initially in a bit of a state, but with the dilligence of the Freestyle team things were in order in no time. Freestyle customer services are friendly and very efficient, and I’ve been able to contact them with any questions I may have. As a result any worries or problems I’ve had have been quickly resolved. Finally, the accounts portal is a brilliant tool and very easy to us. I would heartily recommend Freestyle to anyone! Freestyle Accounting have provided excellent advice and support from creating my limited company right through to managing my VAT affairs. The team are always polite, professional and happy to help. The online portal is user friendly and provides easy to understand financial information. I would recommend Freestyle Accounting to any IT professional thinking to enter the contractor market. To file accounts for my Limited Company. I have been with Kathryn at Freestyle Accounting for the past 18 months or so and Im completely satisfied with the service. The team is very friendly, quick, knowledgeable and professional. I had no knowledge of the business financials when I first opened the company. Kathryn helped me right from the opening of my business and the team is always available to answer any questions related to tax. I now have a better understanding of everything, thanks to Kathryn and her team. The service seems to be a bit expensive, but its all worth it. I highly recommend Freestyle as all you have to do is make a phone call. For now, company do not have any transactions. I am an IT Contractor and Kathryn handles all my accounts and tax affairs both professionally and personally. I often go to her for help and advice and she has never let me down. Kathryn was a great help to me as I made the transition to contracting. Providing advice and guidance at every step, overseeing my affairs and ensuring that I did not fall foul of the numerous pitfalls that ensnare the unwary. Friendly and knowledgeable, nothing is too much trouble for her. Kathryn and the team helped me to setup my company, organise bank accounts and tax affairs, working through each step with the minimum of fuss.Now that my business is established, the online portal provides everything I need to manage my affairs on a day-to-day basis. It takes away the uncertainty of tax affairs and provides simple-to-follow advice on salaries, dividends and expenses.For me, Kathryn and the whole Freestyle service removes any nagging doubts that I may be overlooking something or missing out on the best possible deal. They know their stuff and I would not hesitate to recommend their services. My Ltd company has been running for some years and the services that Kathryn has provided have helped me every step of the way. Whilst I am new to contracting I have been a company director before and have memories of spending large amounts of time dealing with tax and VAT despite having an accountant. Minimising this effort was high on my list of priorities when a friend recommended I take a look at Freestyle Contractor Accountants. I think it’s fair to say my transition to contracting was a breeze due largely to Freestyle. They may not be the cheapest but their complete service is exceptional value and the service is most definitely premium. Much more of a surprise however is the excellent Online Portal. This has saved me so much time and allowed me to keep on top of my company’s financial position. I spend 5 minutes each Friday evening completing my invoicing and entering my expenses. A further 5 minutes at the end of the month allows me to draw my salary, expenses and issue dividends. What I really like is that I can see the entire financial position at any time and yet the overhead for me is minimal. Since joining Freestyle 6 months ago I have received excellent service and advice. I can’t recommend them highly enough. Can I just say thank you very much to all of you at Freestyle for all your help this year, it’s my first year of being self-employed and I don’t think I would have managed it half as well without Freestyle’s help and guidance with all the accounting and tax stuff that I know nothing about (but I’m slowly learning thanks to you & your colleagues answering all my questions clearly and patiently!) I really appreciate your support and am so glad that I signed up with Freestyle! I am not sure who would like the feedback, but I believe in credit where it is due. Since Shabnam has been dealing with things for me the quality and sharpness of work is just great. Many thanks to Freestyle. Sincere thanks for all your help over the last week. John and Kathryn have delivered as they said and I am extremely pleased with the service I have received from Freestyle Accounting. I will of course be referring others to Freestyle as they offer 101% when it matters. I am writing to yourselves in order to thank you for the services provided to date in order that I can easily and timely discharge my legal and regulatory responsibilities in running my Limited company for contracting. The Freestyle Accounting headline statement ‘The Quickest & Easiest Way to Start Contracting through a Limited Company’ is a true reflection of what you provide. As a qualified accountant having left Schedule E long service employment and migrated into the contracting world your professional advice and services have been invaluable. From the setting up of my company through to all accounting and administrative matters you have provided a friendly knowledgeable service. Like many busy professionals I work extensive hours and with a young family I seem to never have the time to fit in looking after my own affairs (usually a Sunday night!). Your service ticks all the boxes and with the varying degrees of service that you are able to provide a contractor, I can vouch that for me having chosen your all-inclusive service it has been the best decision and investment bringing total peace of mind. Please pass on my personal thank you to all the team at Freestyle Accounting Ltd. The portal is easy to use and when you get anything wrong the team are able to make amendments and let you know it’s all been put right. The communication is great and I’ve always had my tax returns and VAT returns done without having to worry about timing or missing the deadlines. First class service, consistently! Shabnam. Once again thanks for all your help. You’ve all been outstanding and patient with all the questions and concerns I’ve raised. Thank you and please pass on my praise to the rest of your team. Just wanted to say how pleased we are with the service to date – everything is dealt with so efficiently and nothing is too much trouble. However, please pass on special thank you to Rachael Lawton for her patience and understanding when guiding me through the financials on the portal, and dealing with my questions and queries – she is a star, and a credit to your company. Want to be this happy with your accountancy service? – request an income illustration today.